Physical Geography: Making Sense of Planet Earth encompasses earth systems, from the smallest land feature to whole continents ... to how weather affects the planet ... to how humans interact with natural resources and their physical landscape. 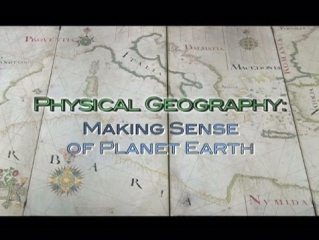 Presented by acclaimed geographer Alec Murphy this incredible series shot in HD reviews significant discoveries, individuals, and theories that have led to physical geography becoming one of the leading sciences of the 21st century. In program one, Alec Murphy presents an historical narrative of the principles that form the foundation of geography, including the three laws of geology, the importance of scale and the origins of the two great branches of geography: physical and human. 00:07:32Geographical thinking brings an analytical perspective to bear on the world - treating the 7 billion people living on the planet as part of an interconnected web of earth processes as well as landforms and developing human cultures that coalesce in distinct ways. 00:02:33The three laws of geology created by Danish naturalist Nicolas Steno are the Law of Super Imposition, the Principal of Original Horizonality, and the Principle of Discontinuity. 00:11:34Charles Lyell and his book Principles of Geology and Louis Agassiz and his book, The Discovery of the Great Ice Age, which talked about glaciers and glaciation, overturned the 19th century's two great theories on the formation of the Earth, the Neptunist Theory and the Plutonist Theory, and led to the theory of plate tectonics proposed by Alfred Wegener in 1912 and first conceived by, Abraham Ortelius in the 16th century. 00:04:50The impact of human geography began after the Ice Age with agriculture, and the understanding of earth systems and the importance of geography began with geology and geologic forces that formed the planet's surface , such as the Delicate Arch in Arches National Park. In program two, Alec Murphy focuses on the history of portraying the Earth and the earliest maps of ancient Greece, the 21st century computer-based GIS, Geographical Information Systems, as well as a visit to the U.S. Geological Survey, the institution that has served as America's center for mapmaking for the past 150 years. 00:08:30U.S. Geological Survey, USGS, was founded in 1879 and used tools such as the alidade, plane table and scales for cartography or mapmaking, which selected map worthy features to create maps. 00:01:38Cartography, mapmaking, in the in the last 50 years has improved because of GIS - Geographical Information Systems- and LIDAR - Light Detection And Ranging. 00:02:08In the 21st century cartography, or mapmaking, has improved with the addition of GPS, Global Positioning Systems, Google Maps, Map Quest Google, and U.S. Geological Survey's three dimensional contour maps. In program three, Alec Murphy categorizes and defines the major landforms found on the planet's continents, including mountain ranges, river valleys, plateaus, basins, mesa, buttes and narrow canyons. 00:04:04From observations of topographic features such as mountain ranges came the geomorphology, the scientific study of landforms and the processes that shape them. 00:06:20Mountains, such as the Appalachian Mountains, and hills are landforms that have been important to human cultures such as the Andes Mountains were to the Incas and can be seen at Machu Piccu, or to the Romans and can be seen in Rome at the Capitoline Hill. 00:01:03The landforms, buttes and mesas can be seen at Canyonlands National Park in Utah. 00:02:32The landform a plain is the common geomorphic term for flatland and it is also known by terms like prairie and grassland as can be seen in the Great Plains of North America; and when plains get high enough they are called plateaus, such as the Columbia Plateau. 00:03:09Landforms that are sunken or depressed below the surrounding area are known as basins, canyons and valleys, of which there are U-shaped and V-shaped valleys. 00:04:48Human habitation can have an affect on the physical terrain or landforms, such as rivers, through agriculture, roads and cities. In program four, Alec Murphy walks viewers through the forces shaping and destroying the planet's many landforms, including water erosion, wind erosion, glaciers, continental drift, plate tectonics, earthquakes and volcanic activity. 00:02:21The grandeur of Earth's changing landscapes can be seen in the creation of the big island of Hawaii, the hill where the Greek Acropolis stands, the Rocky Mountains and the Grand Canyon. 00:09:41Alfred Wegener proposed that the Earth's crust was made up of continental and oceanic plates and that the continents were once all joined in a super continent, Pangaea, but Continental Drift separated them and through tectonic forces such as subduction mountain ranges like the Cascade Mountain Range with its volcanoes were formed. 00:04:03The hotspot in Yellowstone National Park formed an immense caldera that became the Yellowstone plateau. 00:01:44Water erosion created the Grand Canyon of the desert Southwest and the, Grand Canyon of the Yellowstone. 00:01:00Wind erosion created the Algodones Sand Dunes in California. 00:06:48Glaciers and glaciation created Yosemite Valley in the Sierra Nevada Mountain Range; and in addition also create, outwash plains, moraines - recessional and terminal moraines and kames. In program five, Alec Murphy shows how Earth's many spheres - the inner core, the crust or lithosphere, a soil layer, known as the pedosphere, the hydrosphere, the atmosphere and biosphere - are all interconnected in one dynamic system. 00:02:22The badlands of the John Day Fossil Beds, reveal the effects of volcanic eruptions during the Cenozoic Era ,on all the major spheres studied by physical geographers - the lithosphere, biosphere, atmosphere, pedosphere and hydrosphere. 00:01:52The Earth's surface is made up of continental and oceanic plates, which interact in plate tectonics, while the Earth itself is made up of three main shells, crust, mantle and core. 00:02:49The lithosphere is made up of igneous rock, magma, sedimentary rock and metamorphic rock and it interacts with the pedosphere. 00:03:22The pedosphere, or soil, has many kinds of soils such as spodosols, mollisols and aridisols, and it is important because it interacts with the lithosphere, biosphere, atmosphere and hydrosphere. 00:04:39The hydrosphere, through the hydrological cycle is important because of how it affects climates and creates forces, such as water and glaciers, that affect landforms. 00:01:10The atmosphere has water and gases in it, is powered by solar energy and uses evaporation and, precipitation to affect the biosphere. 00:04:21The biosphere is all life - vegetation, animals and microbial life on the planet; and thanks to the efforts of Nikolai Vavilov we can see how the Earth has different biomes - the tundra, coniferous forest, temperate deciduous forest, grasslands, deserts, Mediterranean shrub or chaparral, and tropical. 00:04:46Rock, soil, water, air, and life correspond to the lithosphere, pedosphere, hydrosphere, atmosphere and biosphere respectively, and are studied through biogeography, geography and Earth systems sciences by scientists such as geomorphologists and pedologists. Regions are one of the most important tools used in geographical thinking, and in program six, Alec Murphy shows how the planet is divided into physiographic or geomorphic regions, each with internal dynamic processes and then defines the three types of regions: formal, functional, and colloquial. 00:04:54The Great Basin, a part of the Basin and Range, is a desert whose topography and biogeographic characteristics - desert flora and desert faun -classify it as a region, a geomorphic region, or a physiographic province in order to say the processes within that region are similar, and it's a useful way of describing landscape processes that produce a certain set of landforms. 00:03:57A plateau, such as the Colorado Plateau in the Four Corners Area, which was formed by the Farallon Plate meeting the North American Plate as well as by water and rivers like the Colorado River creating canyons and badlands, is an example of a geomorphic or physiographic region. 00:02:27East of the Appalachian Mountains is the Atlantic Coastal Plain, a physiographic region with a plain and a coastline and formed with podzolic and ultisolic soils. 00:02:39The geomorphic, or physiographic, regions - the Great Basin, the Colorado Plateau and the Atlantic Coastal Plains- are broad-scale subdivisions based on terrain texture, rock type, and geologic structure and history, a perspective pioneered by American geographer Nevin Fenneman. 00:04:51Scale can help reveal what is important about regions, for example, rivers and their watersheds often cut across multiple physiographic regions, as when the Colorado River originates in the Rocky Mountain provinces, cuts across the Colorado Plateau, enters the Great Basin and exits into the Gulf of California. 00:06:46The three types of regions are vernacular regions--regions of perceptual significance such as the West ... Functional regions--regions that function as a unit such as the San Francisco Bay metropolitan area ... And formal regions--regions that are characterized by the presence of a particular phenomenon. 00:04:02Environmental determinism is the concept that environments and resources determined technology and human culture or human civilization. 00:03:49Many ancient civilizations were built along rivers such as the Fertile Crescent along the Tigris and Euphrates, the Indus Valley in India, or the Mississippi River's Cahokian Mississippian Culture, whose pyramids were discovered by the Spanish Conquistador, Hernando DeSoto. 00:07:28The mistaken importance of environmental determinism, or how geographical factors determine human culture and civilization, can be shown through studying the Maya and the Mayan culture in the rainforest of the Yucatan. 00:06:00The impact of environmental determinism on agriculture in America can be demonstrated first, through the land surrounding George Washington National monument along the shores of the Chesapeake Bay, where 200 years ago Humphrey Davies's book - Elements of Agricultural Chemistry - brought a new era to farming with the idea of fertilizing, and second, in the Great Plains, where irrigation was an important factor. 00:03:34How natural resources can affect human's interaction with the land can be seen in the search for gold in the Plains Indians sacred Black hills of South Dakota. 00:01:13The physical environment places constraints on what is possible, even through technology, in human impacts on landforms, and the physical landscape, in addition, physical processes such as earthquakes are destructive and can cost much time, money and even human lives. In program eight, Alex Murphy examines the Paleolithic Age, the Neolithic Age, Ancient Civilizations and the Modern Age to show how human beings have become a geographical force transforming the landscape and what the future holds for the planet and the 7 billion people living on its surface. 00:01:17This process of humans transforming the physical landscape, the physical geography of the planet, is not a new thing and includes building dams and using bulldozers to move great quantities of earth. 00:01:31At the end of the Ice Age, in what is called the Paleolithic Age, humans gathered in groups large enough to alter the landscape, for example by improved hunting of animals with better spearheads, created in flint quarries. 00:03:42During the Paleolithic age, Ancient Britons settled Britain, then during the Neolithic or New Stone Age, they developed a better stone tool technology, began clearing forests and began building megaliths like Stonehenge, thereby altering the landscape. 00:06:31Ancient civilizations, such as the Inca Civilization in the Andes Mountains of South America, transformed the physical landscape, or natural landscape, through agriculture and domesticated animals. 00:07:37Changes to the physical landscape during the Modern Age can be seen in the Hoover and Glen Canyon dams on the Colorado River and the creation of, Las Vegas and the Imperial Valley and the effects on the Grand Canyon, as well as in Illinois with the coal mining industry. 00:05:29In the future, or the Anthropocene Age, the physical landscape is not just a blank stage where the human drama will play out, such as with genetically modified foods, but humans will need to not only the individual components of the environment - the geological, biological, atmospheric and human features but the places and patterns created by the interaction of these features.